Working here has its perks. I get to engage in a lot of “pen talk” with people that admire and use pens. I get to watch pens being designed and the process they all go through. I get to spend a good chunk of time hanging out with some pretty cool people. And then every once in a while I get to use a really cool new concept pen before the official release date. That’s what happened here. A little background on the pen is in order. If you are an internet savvy shopper, you have heard of a website called Massdrop. Massdrop describes itself thusly, “an online community for enthusiasts that provides people across several communities – from audio and electronics to quilting and cooking – a place to connect, discuss their favorite products and activities, and buy those products together.” They accomplish this by listing polls their members vote on, when an item on a poll reaches a certain number of votes, Massdrop reaches out to the manufacturer of that item and ask for a partnership in order to sell the specific item, this is called a “drop”. The more people that purchase the “drop” the lower the price point on the item. It’s an innovative way to get some good deals on quality items. 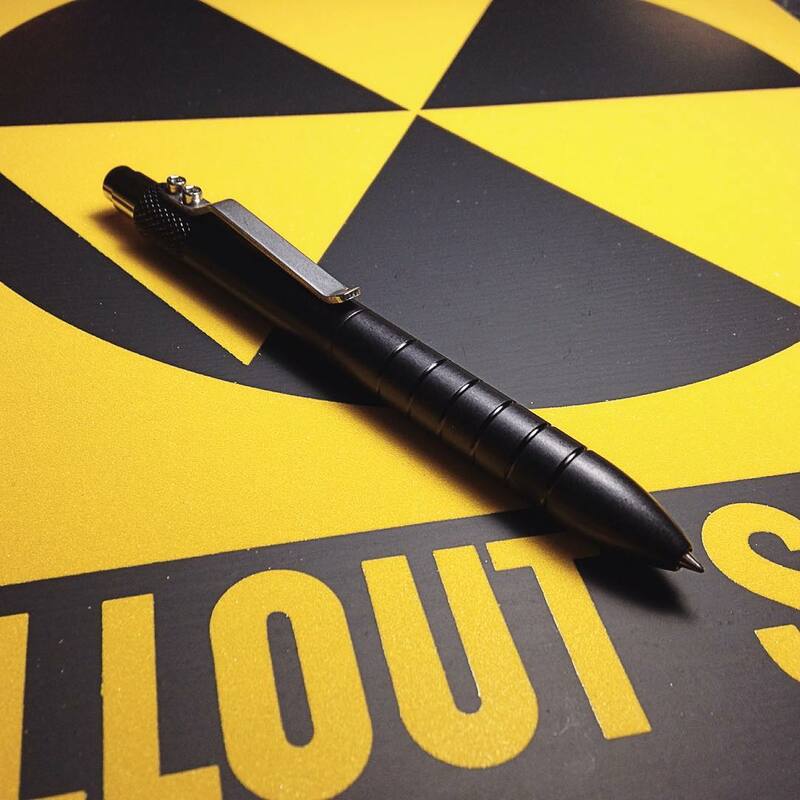 We have partnered with Massdrop on numerous pen drops. And each once has been highly successful from our perspective. Massdrop runs a pretty tight ship and they focus on great customer service and communication. It’s a really great way to get your product out to the consumer at large. Recently Massdrop approached us with the idea of doing a Massdrop Exclusive release. Meaning we would release the product via Massdrop before we released it anywhere else. The idea was intriguing and had definite merits. 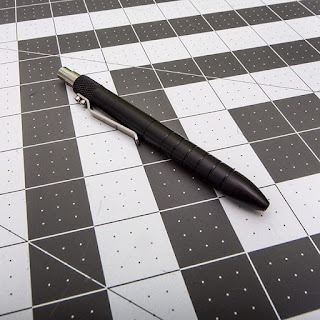 So Dan set about creating a pen that would fit the Massdrop community at large. From this was born the EDK pen. 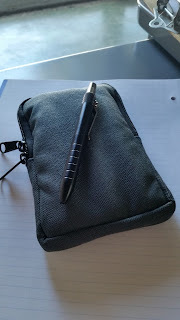 The EDK is a pen that has another story behind it, but I won’t bore you with more of those details, rather I will take you through the main features of the pen itself and then give you my thoughts on it after using it out in the field, by that I mean in a college classroom environment. The pen itself takes design elements from the Retrakt and the Bolt and molds them together into one pen. It’s slightly shorter than merely screwing a Bolt Barrel onto a Retrakt Body. The reason for that is that the EDK was designed specifically around the Schmidt P8126 refill. What’s that you ask? It is a specific “cap-less” roller ball ink refill that has a one year cap-off time, meaning the ink will not dry out for a year when left uncapped. That makes this refill the perfect refill for a click pen. There are a number of other reasons why the P8126 is such a good refill. I will go through my own thoughts on the refill as we go along. I have a three hour lecture class, and I am a pretty thorough note-taker. I find I learn better when I take notes. Also I am a fountain pen guy, I enjoy writing with a fountain pen and engage more when I take my time and use a fountain pen. I have used a lot of different pens for quick note taking, quite a few of them are pens we make and sell. I also use my Pilot Vanishing Point for quick notes as it has a retractable nib. But even that pen isn’t the same. It writes well, but if I end up needing to take a lot of notes my hand cramps as the Pilot VP design makes it necessary to use a specific grip to get around the clip. So for the most part I have stuck to using a myriad of different capped fountain pens: from the Karas Kustoms Fountain K to the Pelikan M200 to a personal favorite the TWSBI 580. They all have their qualities and quirks but the biggest drawback is they require recapping after each use and during a 3 hour class that can get a little old. Enter the EDK. I grabbed one of the very few samples we had made and put it together. First thing I noticed is the size, the pen itself is shorter than any of our current pens, but it is still a substantial pen. It has a decent weight, and it balances quite well. How well, you can turn it upside down and get it to stand on its own on the back end of the click mechanism. That’s how well balanced the pen is. But in the hand it falls right into the webbing between my thumb and forefinger and rests comfortably. The grip area has several recessed rings, that give the pen a nice added texture, but they aren’t distracting or rough. 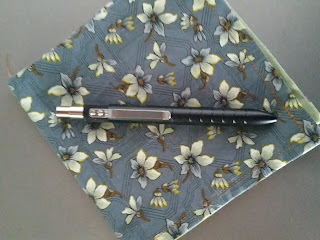 I was using the matte black anodized pen and the matte finish is a not as “slippery” as our bright dipped anodized pens. Overall a solid design and top points in functionality. Performance wise is where the pens really shines for me. The minute I touched the tip to the page I knew I was in for an awesome writing experience. And that’s exactly what I got. The ink flow is wet, but not enough to be distracting or streaky. Due to the amount of notes I take, I tend to use lower quality paper, stuff that doesn’t hold up well to really saturated inks or broad nibs. I was worried about how the P8126 would handle on my “lo-fi” paper, I shouldn’t have worried. It held up like a champ. While the ink “feels” wetter, in reality it isn’t. The combination of the rollerball mechanism and the ink chemistry just make for a superior writing experience. Combine that with the balance of the pen, and you are in for a truly otherworldly writing instrument. I have always felt like the Parker Style refill required too much pressure or a heavy pen to ensure the pen writes consistently. And the Pilot G2 refill feels sloppy to me. Writing with a G2 refill takes my poor handwriting and makes it completely illegible. Not so with the EDK, the balance is superb. I can write with nearly zero pressure and I am left with consistent readable lines. No smudging, no blotting, no areas of ink void due to lack of pressure. The ink behaves itself at this low pressure as good as it does with hard pressure and I don’t need to worry about bleeding or smearing. And due to the size and balance of the pen, I was able to spend almost 2 hours taking notes without any hand fatigue. A complete win as far as performance is concerned. Lastly I decided to conduct a head to head test between the EDK and my Stealth Pilot Vanishing Point. I decided I would go back and forth on note taking between the two pens, working one paragraph each. I started with the VP. Having just used the EDK, the size and shape of the VP are even more noticeable. But the weight isn’t something that has ever bothered me with the VP. It lays in the web of my thumb and forefinger as well. So for a paragraph of writing, the overall experience of handling the pen itself was about what I would have expected. That being the clip was the only thing that bothered me. I have an EF nib on my VP, it allows me to write on the worst paper available and not worry about bleeding or other issues. It seemed a bit dry, but has always felt that way. It tends to be scratchy and I thought when compared to the EDK it would seem even scratchier, but that wasn’t the case. After a paragraph of writing, my hand was fine, and the experience was ok. Nothing to rave about but also the complaints I thought I would have weren’t present. EDK time, again the overall size and shape jumps right out at me. There is a big difference in how the pen feels when compared to the VP and that remains the biggest takeaway. Much smoother than the VP, not nearly as fine of a line than the VP. Balance is again comparable even though the EDK is a bit heavier. But it writes so nicely that I enjoyed myself more when using it than I did when using the VP. And that’s basically my final thoughts on this one. 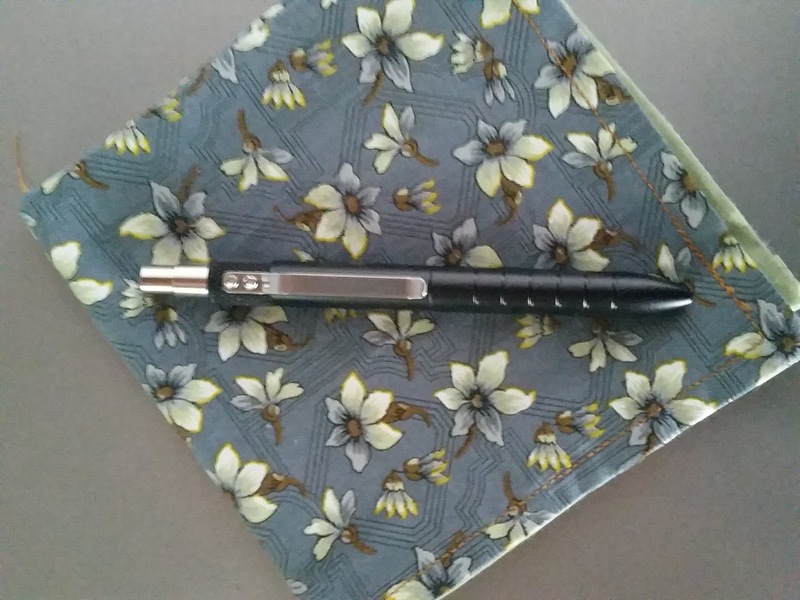 From a fountain pen guy, that truly ENJOYS writing with a Fountain Pen, the EDK is the ONLY non-fountain pen that provides that same level of enjoyment. 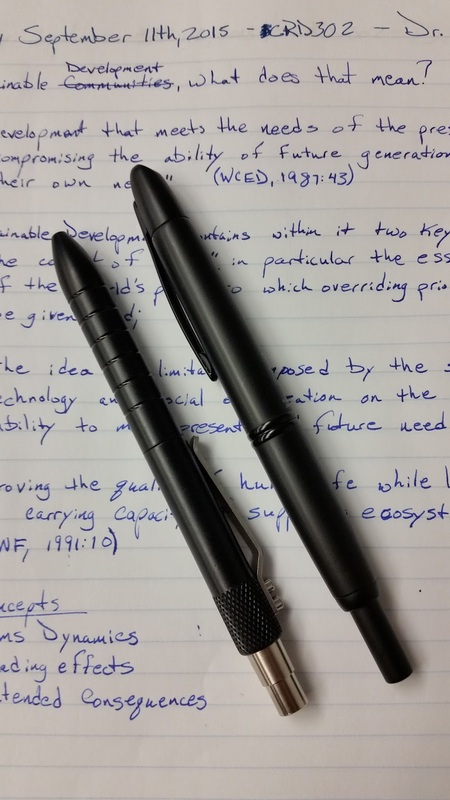 There are two other factors, balance being one and the P8126 being the other, that make this pen just an outstanding writer. I fully expect to trade in all of my other ballpoint pens for a stack of EDKs in every color and material combination available. But I have to be patient. Just like the rest of you wonderful people. This one’s a winner folks, coming to a Massdrop near you, SOON! The Rings and Matt finish are nice! Will this accept other refills? I will probably love the Schmidt but I don't like to be locked into one refill. It is designed completely for this refill. It will accept a Parker Style refill, but the tip protrudes from the barrel a weird depth so visually it looks strange but it will work. Due to the relative short and fat nature of the P8126 there are not many other options for hacks on this pen. Can't wait for this to drop. Would love to hear more of the back story on the EDK. And is that Nock Co Halftower? Looking great. OK, I'm sold. Where do I sign? How about launching one that is compatible with the mini-G2 refill? I too would like to see a Karas Kustoms pen built around the mini-g2 refill!